We’d love your help. Let us know what’s wrong with this preview of Outrageous Openness by Tosha Silver. “What if the Divine is constantly igniting roadside flares to get our attention? What if there actually is a Supreme Organizing Principle with A collection of spiritual lessons, anecdotes, and thoughts on the Divine’s intervention in our lives, this brilliantly written and wonderfully entertaining book teaches us how to live purposefully and in line with the Force of Love. To ask other readers questions about Outrageous Openness, please sign up. Since Valentine's Day is "International Book Giving Day" I asked for this for my gift. I follow Tosha Silver on FB and have been intrigued by some of her posts about astrology and excerpts about this book. This is a great read for the open-minded and open-hearted. What a touching book for the heart chakra! It has such good stories and practical advice relating to the practice of trusting the Universe for our good and not living small and in fear. I'm a huge fan of spirituality books and have been Since Valentine's Day is "International Book Giving Day" I asked for this for my gift. I follow Tosha Silver on FB and have been intrigued by some of her posts about astrology and excerpts about this book. I'm a huge fan of spirituality books and have been manifesting for years, but you can easily lose sight of how to do it under the stresses of everyday life and lose the connection. I feel as if I know Tosha without ever meeting her. Both, hard workers and a bit nervous from growing up under constant scrutiny, we try, try, and try some more to make things happen. O.k., force things to happen to feel worthy. GET THIS BOOK! You will not regret the small price for the immense wisdom and joy found between the pages, and in my case (the audio book) in the calm lovely voice of the author herself! This book could not have come at a more perfect time for me – exactly the message of Tosha’s book: to notice the signs in day to day life that affirm and guide us on our individual paths and to trust the Divine and let it take the lead. I have read countless books, been to lectures, retreats, and watched so many GET THIS BOOK! You will not regret the small price for the immense wisdom and joy found between the pages, and in my case (the audio book) in the calm lovely voice of the author herself! This book could not have come at a more perfect time for me – exactly the message of Tosha’s book: to notice the signs in day to day life that affirm and guide us on our individual paths and to trust the Divine and let it take the lead. I have read countless books, been to lectures, retreats, and watched so many programs on these principles from many of “the” great teachers and Tosha’s book has spoken to me in just as powerful a way – if not more so. Maybe it’s her humility, her stories of her everyday life and of those around her, and the fantastic suggestions she has given to her clients over the years that make what she shares so powerful. Regardless this book gave me the feeling that this can happen for me too – and wait – it HAS happened for me in the past – so why not again and again? I have known this all along but have kept forgetting that indeed this is a daily practice. Other teacher’s lessons have been powerful, don’t get me wrong. But somehow because I consciously and unconsciously put them on some kind of pedestal, somehow I couldn’t truly feel as worthy or enlightened as the particular teacher I was listening to. Tosha’s book changed that piece for me in a big way. Why? I can’t tell you exactly except that her energy is so genuine, it’s like sitting and listening to a friend, an equal – and somehow that feels more believable to me than someone up on a stage with a crew of people and a huge audience of followers. That’s just me I suppose. 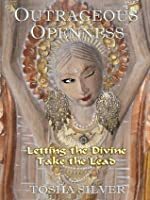 Outrageous Openness – Letting the Divine Take the Lead brings so many spiritual teachings down to earth in a way that is so accessible that it is impossible to not feel something magical happen inside changing while digesting her stories and wisdom. I usually prefer reading over audio books, but this was an unexpected gift, and so I listened. In fact, hearing her voice, after years or reading her column on the SF Examiner gave me a completely different perspective and allowed me to hear things in a way that never got through to me when I read part of that same story in one of her columns. I actually truly enjoyed listening and am now grateful I got it in this format. On my iPod anywhere I go – easy access! I cannot emphasize enough what a treasure this book is. Her wisdom is astounding because she takes age old spiritual principles and shows how easy these are to live in the fast paced modern world we inhabit. Her stories are highly entertaining, full of irony and optimism; and her insight and guidance simple and easy in all of its profundity. I have heard these things over and over for years, but Tosha has put this “handbook for living” into a very accessible and easy to follow read for anyone. If you feel drawn to this book – follow your gut. It has never steered me wrong: something I was reminded of over and over in her words, and which in hearing again, allowed me the permission to become stronger and more self-reliant in trusting myself and the Divine for guidance and answers – AND in how to go about asking in a way that works. I thank Tosha Silver for taking the time and energy to share her words and wisdom with us, and for her incredible honesty and openness. I feel tremendous gratitude for being led to her work and for her courage to share with such love and compassion for humanity. This book has helped me during a crucial time in my life and I KNOW I will be going back to it again and again like a manual for when I need some reminders of what truly matters and some guidance on how to muddle through the mess and let go of the stress. First sentence: Years ago I became fascinated by an adorable book called Are You My Mother?, the tale of a baby bird searching the world for its home. So to me, operating without the help of signs would be like refusing to turn on the lights in a darkened room. Why stumble around tripping over furniture when the Universe has the bulbs? When you knock, ask to see God...not any of the self-appoint First sentence: Years ago I became fascinated by an adorable book called Are You My Mother?, the tale of a baby bird searching the world for its home. Every one has potential luminosity and grace. I have read The game of life and how to play it by Florence Shovel Shin last year and loved it so very much. However this book is like the 2014 version. It is so inspiring and I will be rereading this book over and over in the future. I believe it will help centre me and help me to have FAITH in the divine even when I am feeling down. This is a super funny, witty, charismatic and entertaining read! And not to mention super practical. This isn't some dense new-age theoretical read or some religious mumbo jumbo. It's a smooth, rich, and delightful and fun read into what the heck all this law of attraction is REALLY about! This was an amazingly inspiring and soothingly hopeful book. I read "Outrageous Openness" almost at one go and right after that the author's other book Change Me Prayers, so I'll review these together, as I can't separate my thoughts about these both wonderful books. These books where both entertaining to read - "Outrageous Openness" even more so. The stories give a wonderful rainbow of ways small selves make their own life harder, which helped me to recognize things of myself. I didn't only noti This was an amazingly inspiring and soothingly hopeful book. I read "Outrageous Openness" almost at one go and right after that the author's other book Change Me Prayers, so I'll review these together, as I can't separate my thoughts about these both wonderful books. 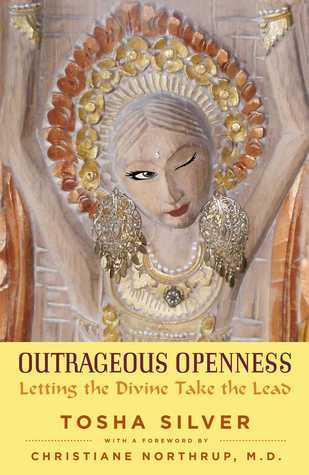 These books where both entertaining to read - "Outrageous Openness" even more so. The stories give a wonderful rainbow of ways small selves make their own life harder, which helped me to recognize things of myself. I didn't only notice "bad things" but a lot of good ways I'm already living and how much those thoughts without doubt have already blessed my life. I don't consider my self a religious type of a person, so for me the divine is some sort of a universal energy or perhaps just my own higher self. These books don't push any particular religion, which I liked a lot. And the following are some reasons why I wanted to read these books and why I'm so happy that I did. I'm quite an idealistic and I feel very anguished because of the state of the planet and how much suffering there seems to be in the world. I struggle with choices what are environmentally good choices overall, how to support small local economics, how much to donate for charity, what to eat, how to exercise, where and how to live, am I good enough and unselfish enough a person etc. There is so much to consider when doing "right" choices. And so many times me wanting something still gets the first priority. Like air travel. I love to travel, but feel bad because of pollution. And every now and then I feel bad that I have so much wonderfulness in my life (non-material and material), and so many seems to have a very little. ... Don't get me wrong. In spite of these feelings most of the time I'm a very happy person by nature. The life just is too beautiful to spoil it by worrying constantly. And I'm getting better and better by the years not to worry about things I don't feel to be able to change. Recommended to Lorilee by: ? This is one of the best spiritual books I've read. I don't like fundamentalism, judgey-ness, or archaic dogma from medieval history that was meant to oppress the masses. But I still feel a universal connection and a natural interest in spirituality that has undoubtedly lead me to Tosha Silver. Her book, Outrageous Openness (OO), has been on my radar for about a year now but I wasn't ready to complete it until now. Personal openness to the possibility of the existence of the Divine has been a str This is one of the best spiritual books I've read. I don't like fundamentalism, judgey-ness, or archaic dogma from medieval history that was meant to oppress the masses. But I still feel a universal connection and a natural interest in spirituality that has undoubtedly lead me to Tosha Silver. Her book, Outrageous Openness (OO), has been on my radar for about a year now but I wasn't ready to complete it until now. Personal openness to the possibility of the existence of the Divine has been a struggle. I've constantly wavered back and forth on the subject. Sometimes I still do and probably always will. But that's ok because it's healthy to question, healthy to seek. What's unhealthy is to be closed to possibilities, closed to the universe, and just uninterested in growing. I heard about this book three years ago. I put it on my request list for my library in January. Just two weeks ago I checked and was slated to get it in July. Last week was terrible. I was stressed and breaking down. Friday I get a call that a book I have requested is available for pick up. I went on Saturday knowing this was the only one I was awaiting. Sure enough, it was there. I started reading yesterday and every single word applied to what I am going through. I saw where I had closed mysel I heard about this book three years ago. I put it on my request list for my library in January. Just two weeks ago I checked and was slated to get it in July. Last week was terrible. I was stressed and breaking down. Friday I get a call that a book I have requested is available for pick up. I went on Saturday knowing this was the only one I was awaiting. Sure enough, it was there. I started reading yesterday and every single word applied to what I am going through. I saw where I had closed myself off to God and the possibilities. I was holding tight and trying to control everything that was out of my control. I read this book in less than 24 hours. Today I ordered it. I need to repeat it over and over again until I learn to completely be open. I would say in a lot of ways I've come a long way from what I used to be, but this book definitely opened my eyes. Just amazing. Sent to me by the right person at the right time; how I found Tosha Silver was actually my first lesson in Outrageous Openness. Read it now and put it in practice--it will make a difference in the very first day. You know that old speculation that if Jesus were alive today, he'd probably be a woman? Well, he is and his name is Tosha Silver. This time around, the professions are astrologer and author but she still teaches with parables. Silver says exactly what all the other spiritual gurus are saying in their books and blogs and seminars. Divine Love is an inside job; Forgiveness is an everyday miracle; Willingness is the roadway and Openness the GPS. It's the stories in Outrageous Openness that make the You know that old speculation that if Jesus were alive today, he'd probably be a woman? Well, he is and his name is Tosha Silver. This time around, the professions are astrologer and author but she still teaches with parables. Silver says exactly what all the other spiritual gurus are saying in their books and blogs and seminars. Divine Love is an inside job; Forgiveness is an everyday miracle; Willingness is the roadway and Openness the GPS. It's the stories in Outrageous Openness that make the difference. These are not tales of a yogi on the mountaintop or contemplative in a cloister. They are practical. The elements are recognizable from every day, 21st Century, First World life. Jesus knew parables worked. Tosha knows they still do. This book is like a spiritual compass for those who are starting to test the waters of the wonders that being one with the divine can bring. Through the author’s personal experiences we get to learn some good ways to be open and receptive to let the divine into our everyday lives. The book is full of anecdotes, both serious and hilarious, but all of them convey the message of how important it is to be in sync with the divine. You don’t have to do outrageous efforts to achieve this you just need This book is like a spiritual compass for those who are starting to test the waters of the wonders that being one with the divine can bring. Through the author’s personal experiences we get to learn some good ways to be open and receptive to let the divine into our everyday lives. The book is full of anecdotes, both serious and hilarious, but all of them convey the message of how important it is to be in sync with the divine. You don’t have to do outrageous efforts to achieve this you just need to be open to it. You can even be polyamorous and invite all the divine entities you like into your life. Buddha, Christ, Quan Yin, Our Lady of Guadalupe, anyone you like and as many as you like. Be open, be receptive, be loving and kind and your life will be filled with miracles. And above all never forget to be grateful. That also will work wonders in your life. One of those audio books I'm definitely going to listen to again. I'm currently enrolled in astrology courses at Kepler, so love the astro bent to this book. I think I heard about it from either The Astro Twins or Anne Ortelee (an astrologer's podcast). The main message is go where the love is and do whatever you want. Aquarians will love it. This is the best book I read in a long time I love how Tosha simply suggests giving everything over to God. I love the affirmation that she uses and I apply to my life everyday......The perfect mate, home career, situation has already been selected its arriving in its own way in its own time I am grateful to receive it. So much fun! You have to be open minded to appreciate this one, but once you accept Silver for who she is, it's easy to grasp what she knows. This is a great book. Tosha is witty and funny, and her comments go straight to the heart ( chakra) . This boom helped me realize that living in my past was draining me. I had to let the divine order hear my dreams and breathe life into them. Great book. Wish I knew Tosha IRL. Perfect in small bits - maybe as a devotion book. Plenty to think on. I believe in the power of the Universe so the idea of Divine Order wasn't too much of a stretch for me. Where I differ with the author is with the idea that using Divine Order makes all of your dreams come true. When she went that route, I wasn't on board. However, the ideas of opening up to letting things happen and that things happen as they will resonated deeply with me and gave me a lot to think about. This is the book that changed my life! What an amazing book! Tosha Silver has taken the idea of letting go and letting God and made it available to the mystically inclined. She has opened up so many doors and sheds the light into new ways of thinking and being. I will definitely reread this right away! A delightful, inspiring read on the reasonableness and joy of surrender to the Divine! All I can say is wow. I loved this book. The Divine brought this into my hands at a time when I absolutely needed it most. I was in desperate need of the reminder to be who I truly am, to love more deeply, and to accept the good and bad things as they arise. Very inspired by Tosha Silver- will 100% be reading more books! What a refreshing view of spirituality! Really opens up a new path for traversing everyday life. I am excited to open up to her methods. I did not see the reason why this book had so many 5* reviews. Had a lot of repetitive patterns and messages. You kind of get the idea 25% into the book and not much changes after that. Errr. People are raving about this book. Me, not so much. I really wanted to like this more, especially since it was recommended by a friend and I love its overall message. And no, this is not a review coming from a skeptical-minded person not ready for these books yet. I’ve read many books on spirituality that I now live by, have Tarot readings done, go to my yoga classes, and burn more sage than is probably healthy… This tells you nothing you need to know about me, but it should tell you that I Errr. People are raving about this book. Me, not so much. I really wanted to like this more, especially since it was recommended by a friend and I love its overall message. And no, this is not a review coming from a skeptical-minded person not ready for these books yet. I’ve read many books on spirituality that I now live by, have Tarot readings done, go to my yoga classes, and burn more sage than is probably healthy… This tells you nothing you need to know about me, but it should tell you that I’m open to these types of books. First, let me talk about what I did like. Basically this book tells you that if you let the Divine into your life, everything will play out just as it should. When you believe that everything is already planned out for you, that whatever happens, needs to happen, stress, anxiety and tension will be relieved. I do believe this. Each chapter is divided into sub-chapters, not more than 2 to 3 pages long, in which Silver gives personal anecdotes of instances in which she chose to let the Divine guide her. She talks in a funny and charismatic way, it’s not overly religious or new-agey hippy language-using. I guess that’s a plus for most people (me included). All of these chapters are repetitive and most of them end with a statement such as: I forgot to invoke the Divine Order so let me say a quick prayer/invocation and then everything turns out just the way it’s planned! Yay! Spot my sarcasm? A few stories are believable. But saying that Divine Order helped you get a parking space…. not so sure. “the uber-Sagittarian offhand way,” “my diligent Capricorn self,” a “double Cancer,” “being born with Neptune on my Ascendant,” or my absolute favorite, “today was a NEW MOON at twenty-seven degrees Leo, on top of my Pluto and Jupiter, opposing my moon and Venus, and squaring Mars and Saturn.” These statements do NOT make sense to the general public. I actually don’t have a whole lot to say about this book. I’m sad this was a disappointment to me because I love the heart and intention that were put into it. The overall message remains true and important, the execution of it could have been better. This was my first Tosha Silver and maybe I’m not used to her writing yet. I don’t know, I just think her writing is not for me.